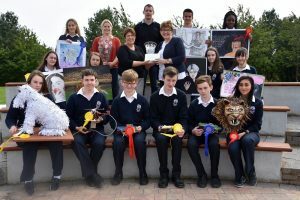 Congratulations go to Abbey Community College, Ferrybank, Waterford who were runners up in the Post Primary Schools section of Arts and Crafts. The section is sponsored by The Munster Express, Robert Kennington Joinery and Gay Doyle Construction. Seven schools participated this year. The judges were very complementary saying that the standard of entries was better this year than ever. Points are awarded to the first, second and third prizewinners as follows, first – four points; second – two points and third – one point. Chairman Robert Dowley thanked everyone involved especially Rose Flynn for all her hard work collecting and organizing exhibits. It is not easy he said especially as the show occurs during holiday time. Our picture shows Rose presenting the trophy to Ms Detta Cahill, Abbey College Principal along with Mr Stephen Dunne, engineering and metalwork teacher, Ms Caroline Duggan, art teacher and the students involved with their amazing creations.